The History of Israel - A Chronological Presentation - 4. Peace With The Arabs? After four years of unsuccessful peace negotiations in the wake of the Yom Kippur War the Egyptian president, Anwar Sadat, took an unpresidented step and accepted the Israeli prime minister, Menahem Begin's, invitation and travelled to Jerusalem in order to discuss the prospects of peace between the two countries. It was a captivated Israeli public, who watched Sadat's televised address to the Israeli parliament, the Knesset. War twelve years earlier, was not in Egypt's interest. The withdrawal from Sinai was completed in stages during the following three years, and included the dismantlement in 1982 of one larger and several smaller Jewish settlements established since 1967. The peace treaty with Israel was met with great resistance in the Arab World, and in 1979 Egypt was excluded from the Arab League. In 1981 Sadat was murdered by a member of an Egyptian fundamentalist Muslim organization. In 1982 there was quiet on most of Israel's borders. Only from Lebanon the PLO frequently mounted attacks against northern Israel. Israel's defense minister, Ariel Sharon, worked out a plan in cooperation with Bashir Gemayel, the leader of a Christian militia in Lebanon, to put an end to PLO's power base in the civil war-torn country. Israel undertook the task of neutralizing PLO's forces all the way to Beirut, after which Gemayel's "Phalangist" militia was to deal with the PLO guerrillas that had entrenched themselves in the capital. When Gemayel had taken over power in Lebanon, a peace deal was to be worked out between the two countries. The Israeli forces invaded Lebanon on June 6, 1982, and defeated both the PLO guerrillas and the Syrian army, which had occupied eastern Lebanon, and on June 13 reached southern Beirut. But Gemayel refused to send his militia into the streets of West Beirut. Instead the Israelis besieged West Beirut and initiated a massive bombardment of PLO's positions in the city. After two months the guerrillas gave up, and were by agreement evacuated from Lebanon to other Arab countries. PLO's leader, Yasser Arafat, went into exile in Tunesia. 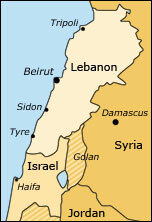 Gemayel was elected president in Lebanon, but Israel's subsequent attempt to reach a peace agreement with him failed. In September Gemayel was killed in a bomb attack. Two days later his Christian Phalangists massacred at least 700 Palestinians in the refugee camps of Sabra and Shatila outside Beirut. The Israeli army, which controlled the area, did not intervene. After public protests in Israel, an Israeli commission of inquiry found that Sharon indirectly shared responsibility for the massacre, and he was forced to leave the post of defense minister. In January 1985 Israel pulled its forces out of Lebanon, with the exeption of a 10 km (6 mile) wide security buffer north of the Israeli border. 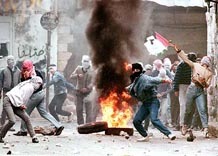 1987 - The First "Intifada"
streets. PLO's attempt to direct the uprising from its headquarters in Tunesia succeeded only to a limited extend, while local groups, including the Islamic organization Hamas, had more influence on the events. The Israeli police and military tried to sup-press the demonstrations, and there were many victims. When the "intifada" died out in 1991, 160 Israelis had been killed. 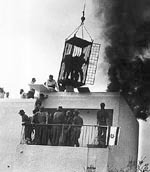 Of the 2100 Palestinians that lost their lives, almost half had been executed by fellow Palestinians due to internal strife or suspicion of cooperation with Israel. coalition, many Palestinians cheered as Iraqi Scud missiles rained down on Israel, while its entire population was crammed into sealed bomb shelters for fear of chemical and biological weapons. The missiles caused only limited damage, however, and Israel avoided being dragged further into the conflict. Due to the Palestinian support for Saddam Hussein, the 200.000 Palestinians that had used to work in Kuwait, were expelled. Saudi Arabia and other Gulf states in opposition to Saddam Hussein completely halted their financial support for the PLO. On American initiative a peace conference was arranged with the participation of Israel, Syria, Lebanon and a Jordanian-Palestinian delegation. The parties met in Madrid on November 1st, 1991, and both Israelis and Palestinians expressed willingness to negotiate a compromise on a transitional arrangement with Palestinian self-government. The negotiations continued in Washington, but even though the parties met frequently throughout the following year, the differences only grew. The Palestinian Islamist organization, Hamas, in December of 1992 committed a string of terror attacks against Israel, the latter responding by deporting 400 Hamas members to Lebanon. The Palestinian delegation withdrew from the meetings in Washington, and though they were resumed in the spring of 1993, the negotiations lead nowhere.